This article is about the anime series. For the mecha themselves, see Gundam (fictional robot). Gundam (Japanese: ガンダム, Hepburn: Gandamu), also known as the Gundam series (ガンダムシリーズ, Gandamu Shirīzu), is a science fiction media franchise created by Sunrise that features giant robots (mecha) with the name "Gundam" (after the original titular mecha). The franchise began on April 7, 1979 with Mobile Suit Gundam, a TV series that defined the "real robot" mecha anime genre by featuring giant robots called mobile suits in a militaristic setting. The popularity of the series and its merchandise spawned a franchise that includes television series, OVAs, films, manga, novels and video games, as well as a whole industry of model robots known as Gunpla (plastic Gundam model). Gunpla makes up 90 percent of the Japanese character plastic-model market. Academics in Japan have viewed the series as inspiration; in 2008, the virtual Gundam Academy was planned as the first academic institution based on an animated TV series. Mobile Suit Gundam was developed by animator Yoshiyuki Tomino and a changing group of Sunrise creators with the collective pseudonym of Hajime Yatate. The series was originally entitled Freedom Fighter Gunboy (or Gunboy) for the robot's gun, with boys the primary target demographic. Early production had a number of references to freedom: the White Base was originally "Freedom's Fortress", the Core Fighter was the "Freedom Wing" and the Gunperry was the "Freedom Cruiser". The Yatate team combined the English word "gun" with the last syllable of the word "freedom" to form the portmanteau Gundom. Tomino changed it to Gundam, suggesting a unit wielding a gun powerful enough to hold back enemies like a hydroelectric dam holding back water. In keeping with the concept, Gundam are depicted as prototypes or limited-production, with higher capabilities than mass-produced units. Most Gundam are large, bipedal, humanoid vehicles controlled from a cockpit by a human pilot. The cockpit is located in the torso, while the head serves as a camera to transmit images back to the cockpit. The series itself has been described as a space opera. Mobile Suit Gundam reportedly pioneered the real robot subgenre of mecha anime. Unlike its super robot cousins, Mobile Suit Gundam attempted realism in its robot design and weaponry by running out of energy and ammunition or malfunctioning. Its technology is derived from actual science (such as Lagrange points and the O'Neill cylinder in space) or feasible technology requiring only a few fictional elements to function (such as Minovsky Physics). Most of the Gundam animation (including the earliest series) is set in what is known as the Universal Century (UC) calendar era, with later series set in alternate calendars or timelines. Although many new Gundam stories are told in their parallel universe with independent timelines (giving them greater creative freedom), the original UC storyline continues to be popular. 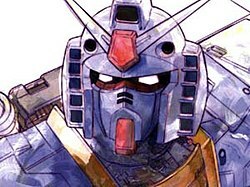 It established the series, setting the standard for hard science fiction in anime; the original Gundam marked the maturing of the giant-robot genre. Nostalgia for the oldest Gundam shows (and its status as a pop-culture icon in Japan) is a factor in its continuing success. SD Gundam, a spinoff of Gundam which began during the mid-1980s, features super deformed designs and emphasizes comedy and adventure. Model Suit Gunpla Builders Beginning G , Gundam Build Fighters ,and Gundam Build Divers feature contemporary settings and use Gunpla as plot elements. Except for Mobile Suit Gundam 00 (which follows the current calendar era), all mainstream Gundam series are set in a fictional era which begins after a drastic event or chain of events. The scenario commonly changes as the story progresses between Earth, space, space colonies and in some cases the Moon and terraformed planets. On July 5, 2018, it was announced at the Anime Expo 2018 that Legendary Pictures and Sunrise are teaming up to developing a Live action Gundam movie. On March 6, 2019, Deadline reports that Brian K. Vaughan will write and will also serve as an executive producer for the film. Manga adaptations of the Gundam series have been published in English in North America by a number of companies, such as Viz Media, Del Rey Manga and Tokyopop, and in Singapore by Chuang Yi. Gundam has spawned over 80 video games for arcade, computer and console platforms, some with characters not found in other Gundam media. Some of the games, in turn inspired spinoff novels and manga. Most Gundam video games, except Dynasty Warriors: Gundam, were released only in Japan. Hundreds of Gundam models, primarily made of plastic but sometimes with resin and metal detail parts, have been released. They range in quality from children's toy kits to hobbyist and museum-grade models, and most are in 1:35, 1:48, 1:60, 1:100 or 1:144 scale. Promotional 1:6 or 1:12 scale models are supplied to retailers and are not commercially available. For Gundam's 30th anniversary, a full-size RX-78-2 Gundam model was constructed and displayed at Gundam Front Tokyo, in the Odaiba district; it was taken down on 5 March 2017. A new statue of the Unicorn Gundam was erected at the same location, now renamed The Gundam Base Tokyo. Bandai, Gundam's primary licensee, produces a variety of products. Other companies produce unofficial merchandise, such as toys, models and T-shirts. Products include Mobile Suit In Action (MSiA) action figures and Gundam model kits in several scales and design complexities. Each series generally has its own set of products, MSiA and model lines such as Master Grade and High Grade Universal Century may extend across series. The most popular action-figure line has been the Gundam Fix series, which includes the mecha in the animated series, manga and novels and accessories to create an updated version. In addition to Master Grade and High Grade Gundams, Bandai released a 30th-anniversary series of Gundam models in 2010. The Real Grade (RG) Gundam series combined the Master Grade's detailed inner structure with additional colour separation, making the 1:144-scale series complex in design and compact in size. After the introduction of the RG Gundam series, Bandai released the Metal Build series in March 2011 (beginning with the 00 Gundam). Bandai maintains several websites to promote Gundam projects; Gundam Perfect Web is the official Japanese site. Its English-language counterpart is the US-maintained Gundam Official. In 2005, the website hosted the Gundam Official User Forum. The forum was based on the existing fan forum, Gundam Watch, using many of its staff. When the project was retired, Gundam Watch was reborn and became Gundam Evolution. A number of series-specific websites have been created, often available for a limited time (usually to promote a DVD release). Common content includes character and mecha listings, lists of related merchandise and pay-for-download content. Special pages are frequent, often presenting downloadable wallpaper or a small game. The Superior Defender Gundam Force website has a game in which players take the role of villain Commander Sazabi, attempting to blast his subordinate with weapons. Gundam is a Japanese cultural icon; it is a ¥50-billion-annual business of Bandai Namco, reaching ¥54.5 billion annual revenue by 2006, and ¥80.2 billion annual revenue by 2014. Stamps were issued, an Agriculture Ministry employee was reprimanded for contributing to the Japanese Wikipedia Gundam-related pages, and the Japan Self-Defense Forces code-named its developing advance personal-combat system Gundam. The impact of Gundam in Japan has been compared to the impact of Star Wars in The United States of America. ^ Lewis, Leo (November 1, 2008). "Gundam cartoon academy to turn science fiction into reality in Japan". The Times. Retrieved July 10, 2017. ^ "Gundam Wing Phenomenon Grows With Addition of New Licensees as Television Ratings and Toy Line Sales Surge". Business Wire. Berkshire Hathaway. June 13, 2000. Archived from the original on 2000-08-21. Retrieved January 8, 2017 – via Yahoo.com. ^ Peters, Megan (June 23, 2018). "'Pokemon' Is The Highest-Grossing Franchise Of All-Time". ComicBook.com. Retrieved August 13, 2018. ^ a b Chris Stuckmann (15 May 2018). Anime Impact: The Movies and Shows that Changed the World of Japanese Animation. Mango Media Inc. p. 42. ISBN 978-1-63353-733-0. ^ Oppliger, John (2007-10-12). "Ask John: Which Gundam Series Have Had the Most Impact on Anime?". AnimeNation. Archived from the original on 2009-06-16. Retrieved 2009-07-28. ^ "Gundam UC Anime Gets TV Broadcast With New Opening, Ending Themes (Updated) - News". Anime News Network. 2016-02-20. Retrieved 2016-09-17. ^ "Level 5 to Help Create Gundam AGE Anime This Fall (Updated) - News". Anime News Network. 2011-06-09. Retrieved 2012-02-17. ^ johnny ridden. "GUNDAM GUY: Gundam Build Fighters Season 2 - New Series Project In Progress!". ^ "Mobile Suit Gundam-san 4-Panel Gag Manga Gets Anime". Anime News Network. June 24, 2014. Retrieved June 24, 2014. ^ a b "Gundam's 35th Year Marked With Reconguista in G, The Origin". Anime News Network. 2014-03-20. Retrieved 2014-03-20. ^ "Gundam The Origin Manga to Launch Anime Project - News". Anime News Network. 2011-06-22. Retrieved 2012-02-17. ^ ""Gundam The Origin" episode 1 90-second trailer released!". Gundam.info. 2014-05-31. Archived from the original on 2014-07-14. Retrieved 2014-07-07. ^ "機動戦士ガンダム　鉄血のオルフェンズ". 機動戦士ガンダム　鉄血のオルフェンズ. ^ "『機動戦士ガンダム サンダーボルト』". 『機動戦士ガンダム サンダーボルト』. ^ "『機動戦士ガンダム Twilight AXIS』". 『機動戦士ガンダム Twilight AXIS』. ^ Fuster, Jeremy (July 5, 2018). "'Gundam' Film: Legendary Pictures to Make Live-Action Anime Adaptation". The Wrap. Retrieved July 5, 2018. ^ N'Duka, Amanda; Boucher, Geoff (March 6, 2019). "Brian K. Vaughan To Pen 'Gundam' Live-Action Adaptation For Legendary". Deadline Hollywood. Retrieved March 6, 2019. ^ "MobyGames: Game Browser". MobyGames. Retrieved 2016-10-27. ^ appetiteforjapan (2015-12-02). "Diver City Tokyo: the ultimate Gundam experience". Appetite For Japan. Retrieved 2017-03-03. ^ "「実物大ガンダム立像」5年の歴史に幕。そして新たなプロジェクトへ！". 公式ガンダム情報ポータルサイト「GUNDAM.INFO」 (in Japanese). Retrieved 2017-04-12. ^ "GUNDAM.INFO | The official Gundam news and video portal". na.gundam.info (in Japanese). Archived from the original on 2016-10-26. Retrieved 2016-10-27. ^ Suzuki, Toshiyuki. "RX-78-2 Gundam (RG) (Gundam Model Kits)". Hobby Search Co., Ltd. Retrieved 12 August 2013. ^ "METAL BUILD FREEDOM GUNDAM". Gundamplanet.com. Retrieved 12 August 2013. ^ "Japanese workers in Wikipedia row". BBC News Online. October 5, 2007. Retrieved 2009-10-01. Wikimedia Commons has media related to Gundam. This page was last edited on 18 April 2019, at 02:04 (UTC).